Can I reproduce that pattern? Why do my eyes bug out when I look at this? Where can you find the Fibonacci numbers? Why does it grow in that neat spirally shape? Why does it look like spirals? How many seeds are in the center? Where in this flower does Fibonacci Sequence begin? How far in the sequence can it be identified using plain eyesight? How many sunflower seeds are in the picture? 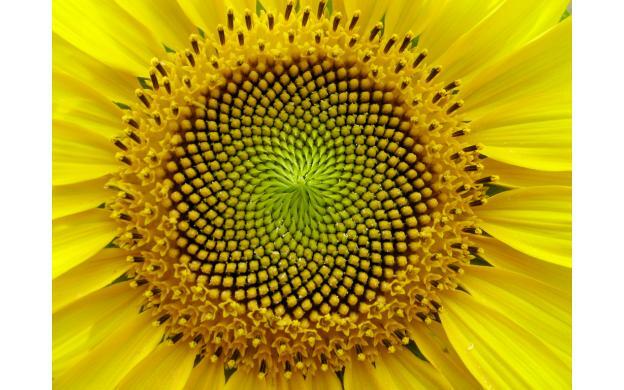 How does the number of seeds along a circle (centered on the flower) depend on the radius of the circleâ€”if at all? What's the rule for where those thingees are positioned? How many seeds? Could I draw that? Could I make that out of clay? What's this have in common with a pentagram? Is that a real sunflower? are there the same number of sprials clockwise as counter clockwise? natural pattern vs mathematical patterns? What types of symmetries does this flower have? I'd be counting something, but I don't even know what to count. Awesome picture. Love it. How many parts are there to a flower? What type(s) of symmetry are in this picture? how does the concentration change when moving outward? How far apart will the stamens be if 5 more layers are grown? How does this pattern form? What is the ratio of swirls? What pattern does this represent? No question comes to mind. It's just cool to look at. Are the numbers of spirals fibonacci integers? Do the spirals follow the Fibonacci sequence? How many circles can be found in this picture? How many seeds are there? WHAT FRACTAL equation would generate this shape? Does this follow the Fibonacci sequence? Does this flower have resemble Fibonacci's Numbers in Nature?